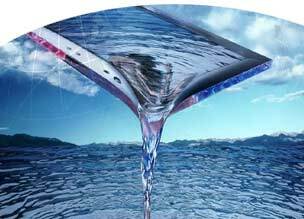 EBD Water�s Seawater Reverse Osmosis Systems are effectively designed to desalinate seawater, producing potable water quality which exceeds the World Health Organization (W.H.O.) standards. 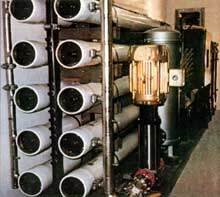 The EBD Water range of Seawater Reverse Osmosis Systems can also be used for other applications, such as increasing the overall recovery for a Brackish System by desalting the brine reject, and many industrial applications requiring high rejection features. As for Brackish Water streams, the feedwater must be properly pretreated to ensure optimum membrane performance. Depending on the feedwater and design specifications, recoveries of up to 50% and rejections of up to 99.9% can be achieved. At all times, EBD Water Seawater Reverse Osmosis Systems are designed to operate within the technical limitations of the water chemistry, temperature, and water velocities. Specifically, the membranes performance is projected at the third year of operation, the average temperature of feedwater is assumed at 25 �C [Design range from 1 �C to 45 �C], turbidity at less than 1 NTU [after pretreatment], inlet silt density index at less than 4 [Design range 3 - 5], feedwater TDS at 35,000 ppm [Design range 15,000 - 50,000 ppm], and inlet pressure of 25 - 60 psig. Based on the above, the highest recommended permeate flow and recovery are calculated.